Harley-Davidson India, today announced the launch of its second dealership in the country's capital, Red Fort Harley-Davidson in New Delhi. Spread over 21,000 sq. 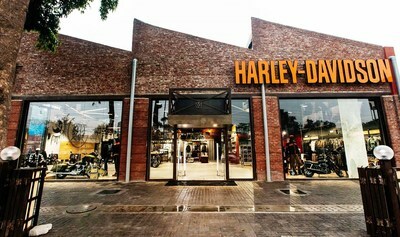 feet, Red Fort Harley-Davidson is located at A-16, Mayapuri Industrial Area, Phase-1, New Delhi. This one-of-a-kind dealership brings Harley-Davidson's never-ending drive towards uncompromising quality and design to life through its inspiring layout. With this, there are now 25 authorized Harley-Davidson dealership facilities across India that cater to aspiring and existing Harley owners. With an exclusive lounge for H.O.G members, a rooftop café, a ride in café, gaming zone, DJ lounge, lockers and showers, Red Fort Harley-Davidson has been designed to elevate and deliver personalized experiences that are authentically Harley-Davidson. From a Black Label lounge inside a shipping container to a Door to Freedom, as a motorcycle delivery idea, the sprawling dealership caters to the nonconformist spirit of motorcycle enthusiasts. The walls are festooned with graffiti and it has a photo gallery dedicated to the personal expression and creativity that reflect the Harley-Davidson culture. Gaurav Gulati, Dealer Principal, Red Fort Harley-Davidson, commenting on the launch said, "Ever since my childhood days, I have been an ardent fan of Harley-Davidson. Launching Red Fort Harley-Davidson is a dream come true which has now made me a part of the Harley family. Being an avid rider and a passionate follower of the Harley lifestyle and culture, I have closely participated in designing the dealership as I wanted to share my experiences and bring alive the practices that every rider would want to enjoy. I hope that the dealership will help riders not feel contained in daily routine and help them enjoy the bohemian feel of the highway." The newest dealership will offer all 13 models in the Harley-Davidson India line up, in-addition to a wide range of parts and accessories to customize motorcycles, and authentic Harley-Davidson merchandise. Enthusiasts can drop by to schedule a test ride or indulge in the latest riding gear, and motorcycle parts and accessories. The passion, enthusiasm and respect the Harley-Davidson brand receives from customers and enthusiasts continues to inspire the company's growth plans. Over the last year, Harley-Davidson India has opened dealerships in various cities including Coimbatore, Ludhiana, Mumbai Airport and Guwahati. Harley-Davidson India commenced operations in August 2009 and appointed its first dealership in July 2010. The company offers 13 models in its line-up in India, in addition to a full range of genuine parts, accessories, and general merchandise, available through its authorized dealerships. Harley-Davidson India is headquartered at Gurgaon, Haryana, and has an assembly unit at Bawal, Haryana. The company has 24 independent dealerships across India: New Delhi, Gurgaon, Chandigarh, Mumbai, Navi Mumbai, Hyderabad, two in Bangalore, Chennai, Kochi, Kolkata, Ahmedabad, Indore, Pune, Goa, Jaipur, Surat, Lucknow, Nagpur, Calicut, Coimbatore, Ludhiana and Guwahati. Harley-Davidson recently launched its first showroom, Mach-1 Harley-Davidson for merchandise only at the Mumbai Airport - Terminal 2 (Departures).